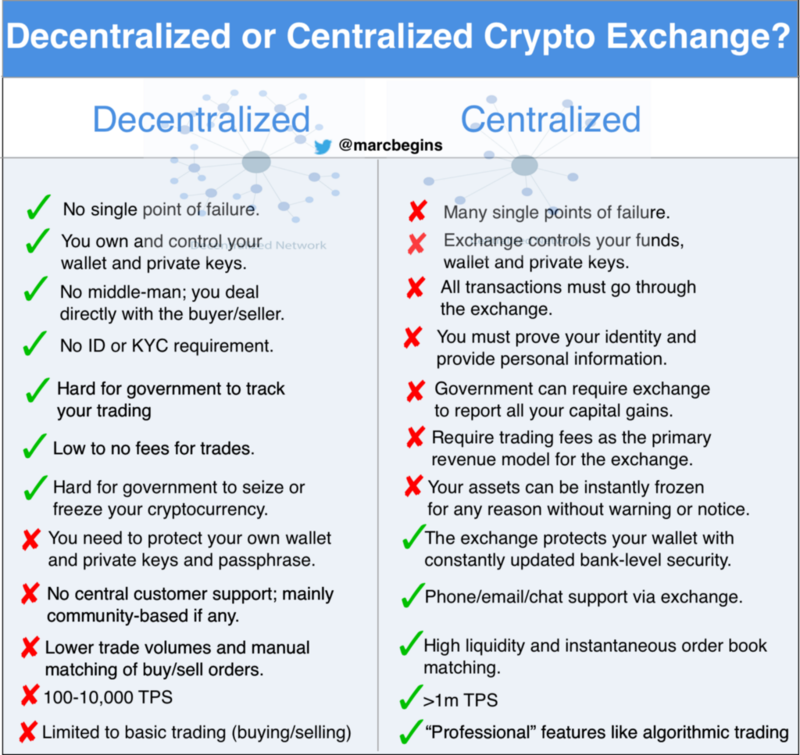 TL;DR: This is a short and no way comprehensive analysis on the pros and cons of centralized versus decentralized cryptocurrency exchanges. By the end you should have enough information to figure out which is for you — or at least be the new “expert” on centralized exchanges around the water cooler. Did you know that there are now over 250 decentralized exchanges in existence today? If you’re in the crypto space as an investor or even an enthusiast chances are you will be interacting with one in 2019. Will they replace the too-big-to-fail centralized exchanges like Coinbase/GDAX or Binance? Yes and no. The good news is that you will get to decide. 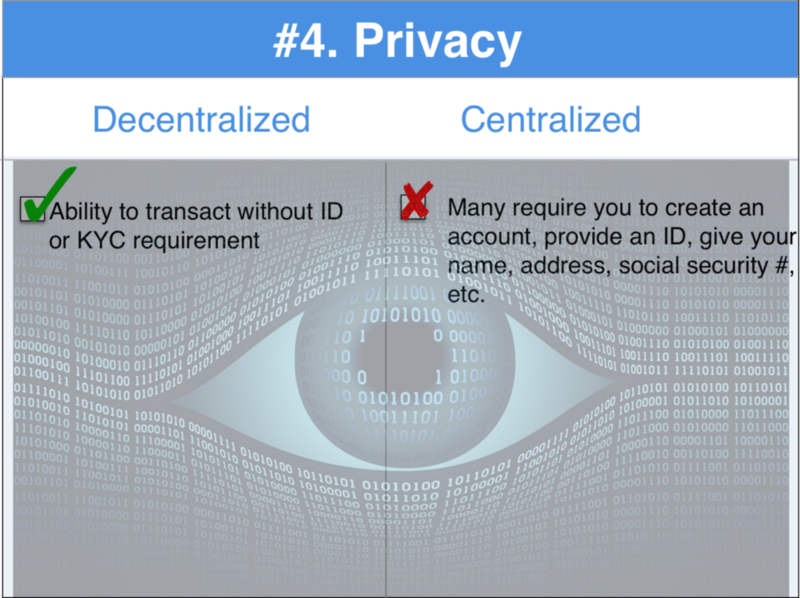 There are many pros and cons between security, privacy, speed, liquidity, etc, etc. 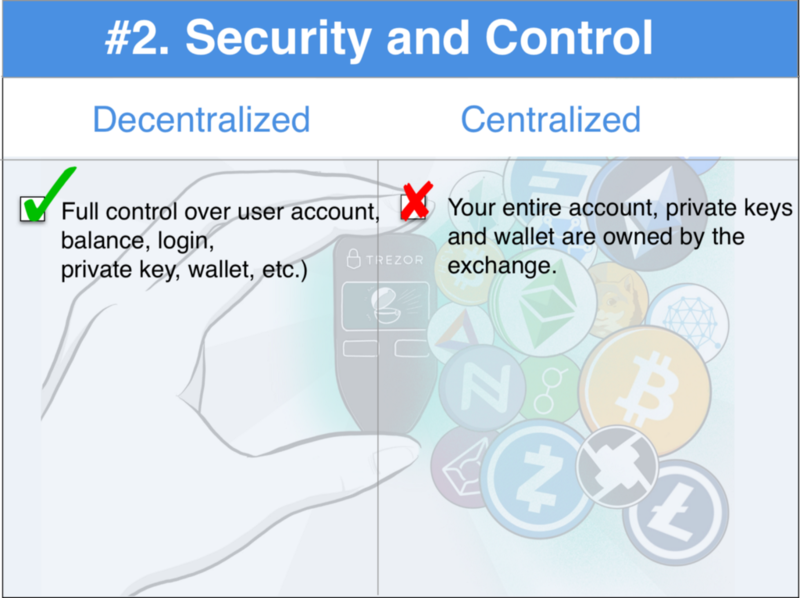 While what I’m sharing is not an exhaustive list, these are some of the main points you may want to consider before trading your hard-earned crypto on a decentralized exchange. What Exactly Is a Decentralized Exchange? A decentralized exchange (DEX) is an exchange market that does not rely on a third party service to hold the customer’s funds. Instead, trades occur directly between users (peer to peer) through an automated or semi-automated process. There are hundreds to chose from today with some of the major players being IDEX, Bancor and EtherDelta. Some have no fees, no need to create an account and no need to give up your wallet or private keys. Others take more of a hybrid approach leveraging the speed and liquidity of a centralized exchange with the privacy and security of a traditional DEX. Remember when you were a kid and you pulled out one Christmas light from the tree? It made all the other lights go out. (Actually I think that’s no longer a problem these days so I’m just showing my age at this point.) Well its the same concept of putting all of your eggs in one basket with a centralized exchange (CEX) — if the exchange goes down or is hacked you could lose all of your cryptocurrency. Banks get robbed. CEXs are like centralized cryptocurrency banks except that unlike accredited US banks they are not FDIC issued. FDIC insured means that the US government promises to reimburse for any fund loss from a bank up to $250,000 USD. This was clearly not the case throughout the history of the major DEX hacks like Mt. Gox ($473m), BitFinex ($72m) and BitStamp ($1.2b). Most DEXs do not hold your funds/wallet. While someone could in theory hack your computer the attack vector is exponentially smaller. The lore of a multimillion or multibillion dollar “honeypot” of a CEX is much greater for a professional hacker than the average person’s local crypto wallet with perhaps a few thousand dollars. 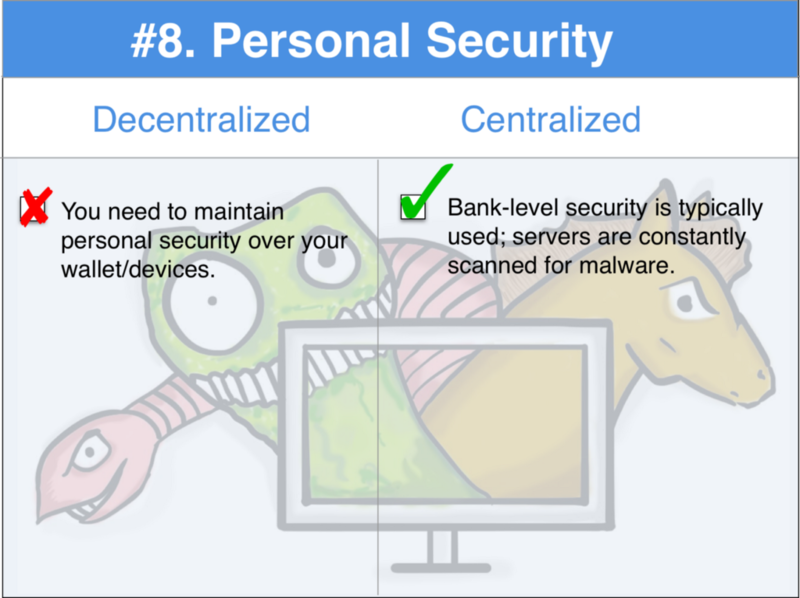 Assuming you’re smart about your wallet and private keys a personal hack is possible but you’re much less likely to be a target. 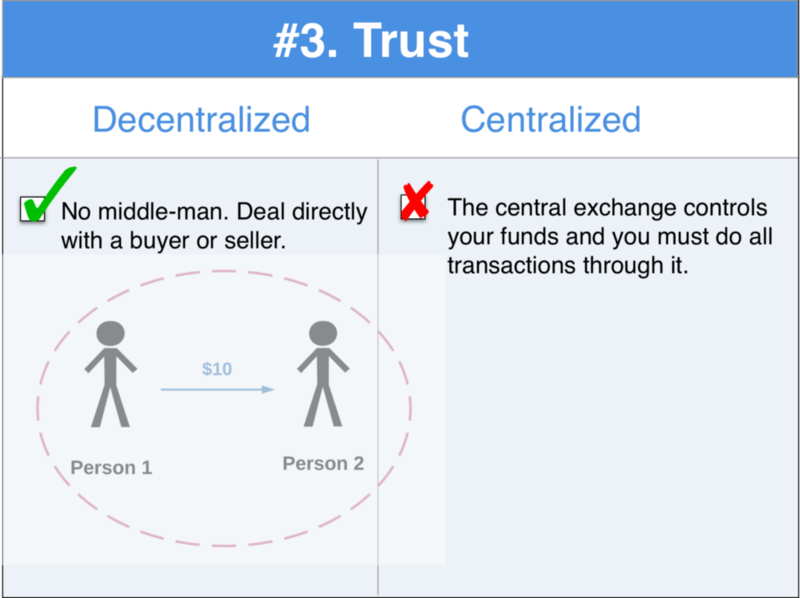 The term “trustless” in the crypto space means that you do not need to trust the person that you are transacting with. With a CEX you must trust them with your personal account information and your wallet. With a DEX you deal directly, peer-to-peer with the other party. Safe guards like escrow or arbiters help keep these CEX transactions honest. It may only be a matter of time before you will be required to give up your first born child. 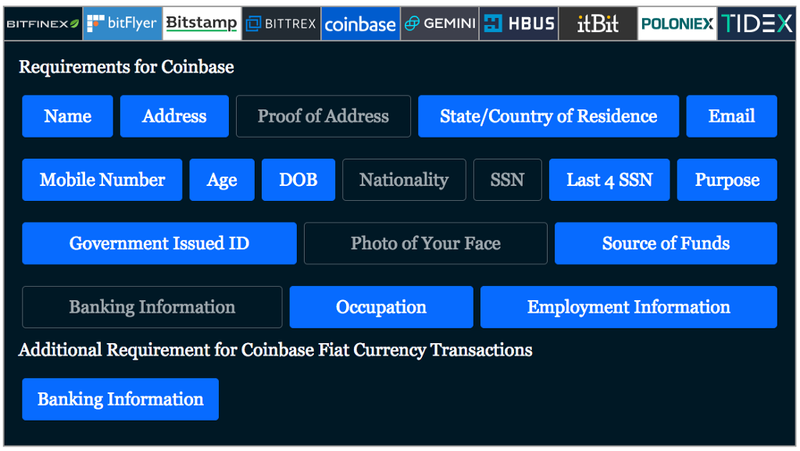 In late 2017 the IRS requested Coinbase, the most popular CEX in the United States to hand over records including the name, birthdate, address, and account activity for any user who bought, sold, sent, or received more than $20,000 worth of Bitcoin in their accounts between 2013 and 2015. These people were placed under investigation for tax avoidance. US citizens are required by law to pay capital gains tax on cryptocurrency transactions and the IRS labels virtual currencies as property for federal tax purposes. Anonymity ties in close with privacy. While its true that you can hide your transactions with privacy coins such as Monero, you still need to register at a CEX to purchase your initial crypto with fiat. This can be avoided using a DEX with no registration requirements. 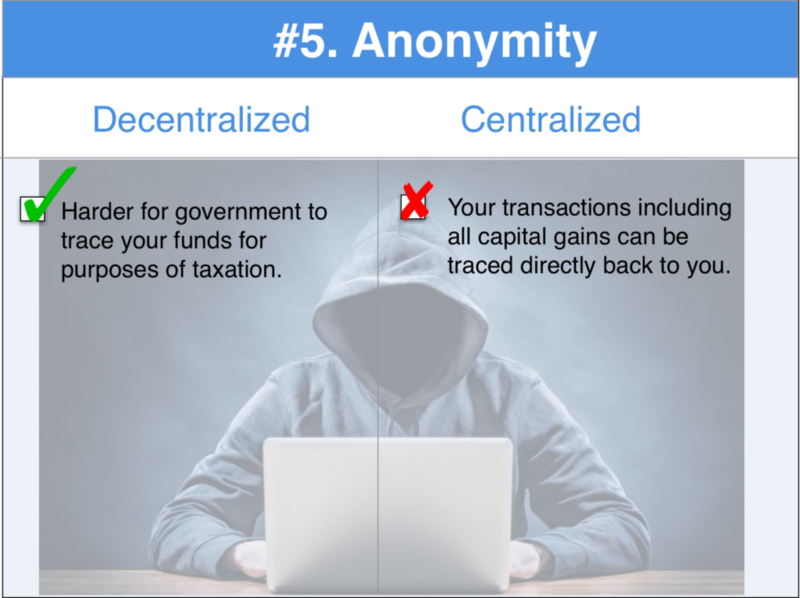 There are many legitimate reasons to move your money around and there is a growing market for solutions like DEXs that make that possible while respecting your right to privacy. Binance expects to make $1 billion in profits this year. Not revenue but profits. This is primarily from user transaction fees which are made no matter whether you profit or incur a loss from your cryptocurrency portfolio. This is the nature of centralized platforms like Uber, AirBnb and Amazon that make billions in profit every year for the privilege of serving as a centralized platform. New models are emerging with DEX technologies like Stellar who actually reimburse you for the network fees and redistribute these funds to active participants on its network. This model is compelling because it incentivizes positive network participation and community growth without the traditional rent-seeking approach of a centralized platform. In all fairness newer CEX startups like Cobinhood allow feeless trading taking advantage of more innovative revenue models such as ICO underwriting and margin trading debt. If a CEX is under government investigation your funds can be seized without explanation. The CEX is under no obligation to communicate to you and is discouraged from doing so. This could be because you chose to trade on an exchange that is under investigation for fraudulent activity unbeknownst to you. While its good that justice can be bought to these dishonest exchanges, this can also mean that you may never see your funds again. 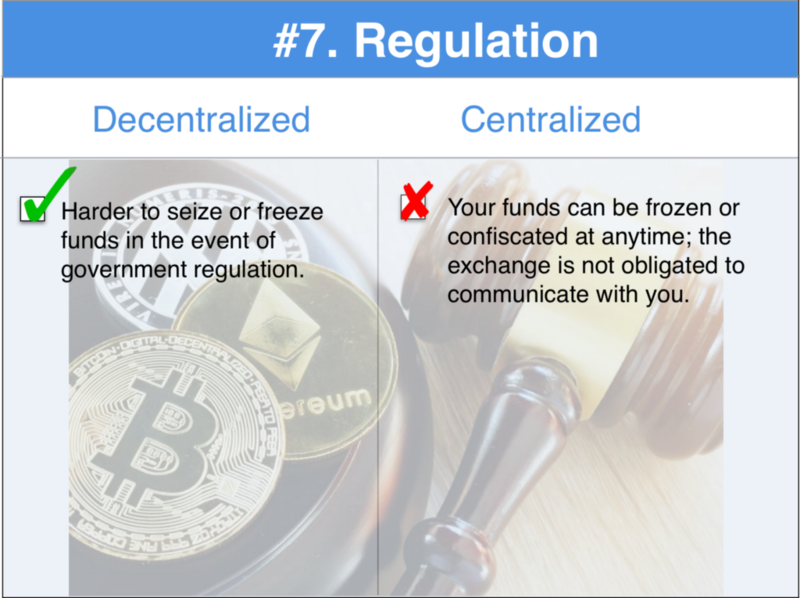 Regulation can mean safety for investors but it can also mean the possibility of your crypto assets being seized. Since you own and control your wallet and private keys with a DEX, this should be a consideration when you’re weighing the pros and cons of doing business with a regulated entity. An argument can be made for the high level of effort that most centralized exchanges take to safe guard assets. Many CEXs use “cold storage” or storing it offline inaccessible to internet-based hacks. If you use a DEX be sure to take extra precaution such as backing up your private keys and using a hardware wallet like Ledger Nano or Trezor. 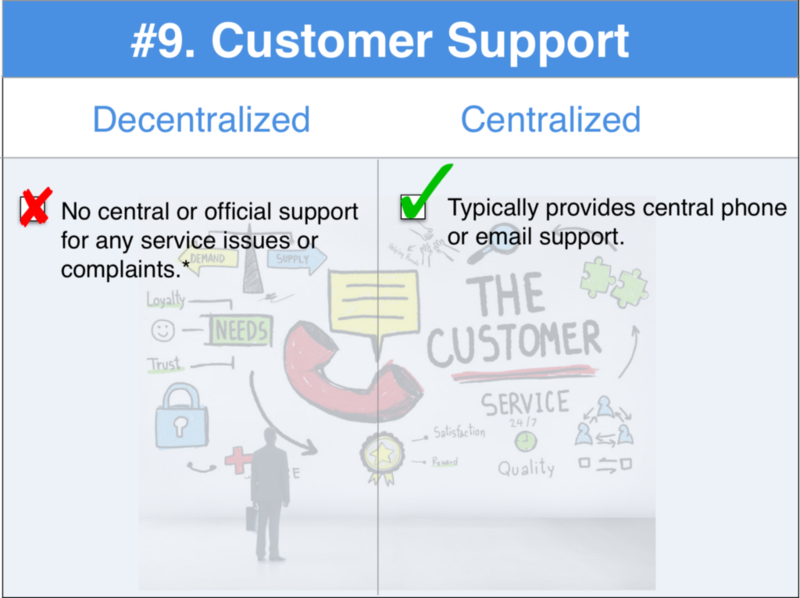 One of the major shortcomings of any decentralized technology is that support is usually wanting. 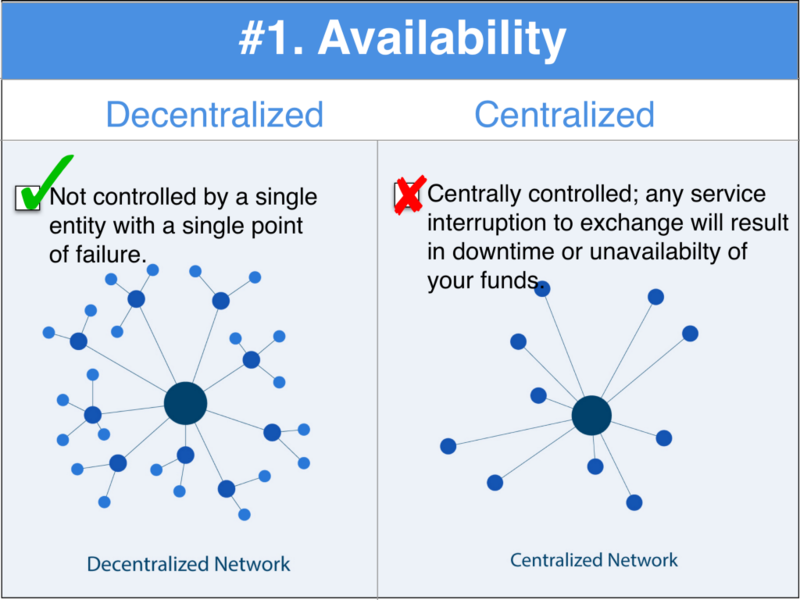 Decentralized typically means there is no one source of control or ownership. I include an asterisk here because this can also be an opportunity. Its typical that the community or peers can provide this support and help its members. This can be challenging with a DEX particularly if something goes wrong and you need help sorting a trade or dealing with a dishonest buyer or seller. There are solutions such as the approach by the DEX Bisq (formerly Bitsquares). If there is a problem with a trade using their peer-to-peer app it can be escalated to an arbiter. This arbiter is paid a small fee from the escrow that the trade funds are held in. Its not perfect but is an interesting model in how to provide trusted support in a decentralized environment. These arbiters are not employees but other peers that stake tokens for their role and could lose a hefty amount of tokens for dishonesty or gaming the system. Liquidity is the degree to which a particular asset can be quickly bought or sold without affecting the general stability of its price. 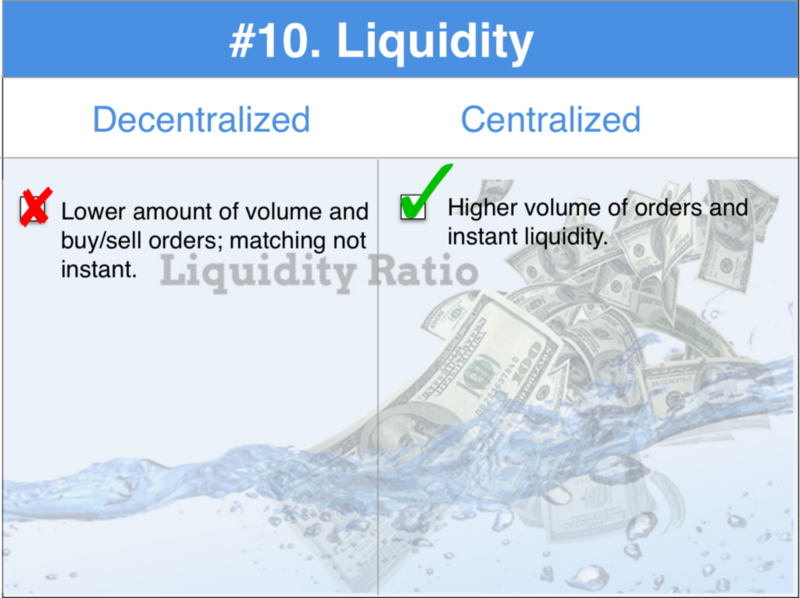 In simplest terms, liquidity refers to the ability of an asset to be converted into cash easily. For example if you want to sell 1000 XRP (Ripple) major exchanges like Binance and Bitfinex allow you to do this instantly and seamlessly without a major impact on price. This is possible because there are many buyers and sellers of XRP on these platforms at any given time. Its not that DEXs do not have liquidity problems its just that DEXs typically have far less volume. So you could be in a situation where you want to sell the 1000 XRP but there is no one to buy. The situation is worse if its a low volume token that is not in the top 100 traded on major exchanges. In this case you could be waiting hours or days for a buyer to come along to relieve you of these tokens. 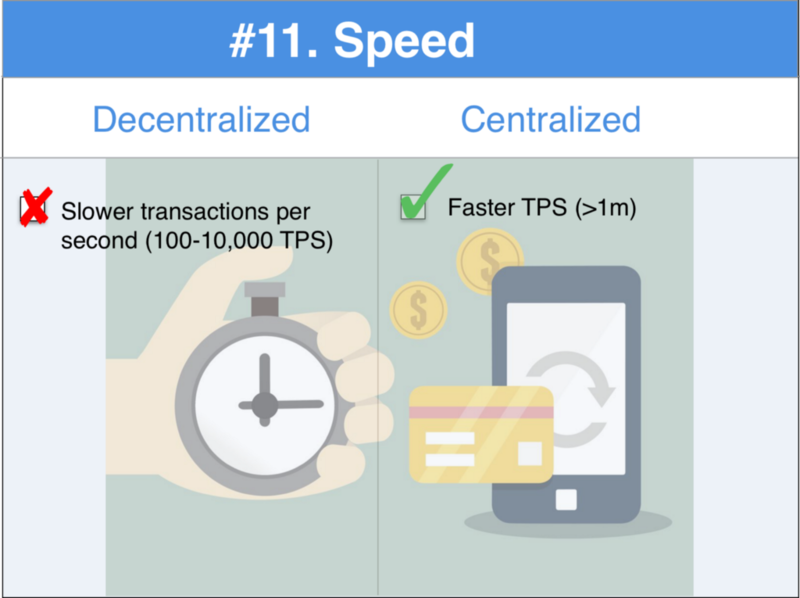 Transaction speed is an issue among many traditional CEXs however more sophisticated protocols like Steller, Bancor, Kyber and Aurora solve speed issues through methods like atomic swaps and smart tokens. Bancor takes the later approach where its smart token is backed by another ERC20 (the standard Ethereum smart contract) tokens like Eth and automatically and instantly trades through the logic in its smart contract. Sounds complex and honestly I had to review the white paper more than once to grasp the concept. The take away however is that next generation DEXs will no longer be impacted by speed. 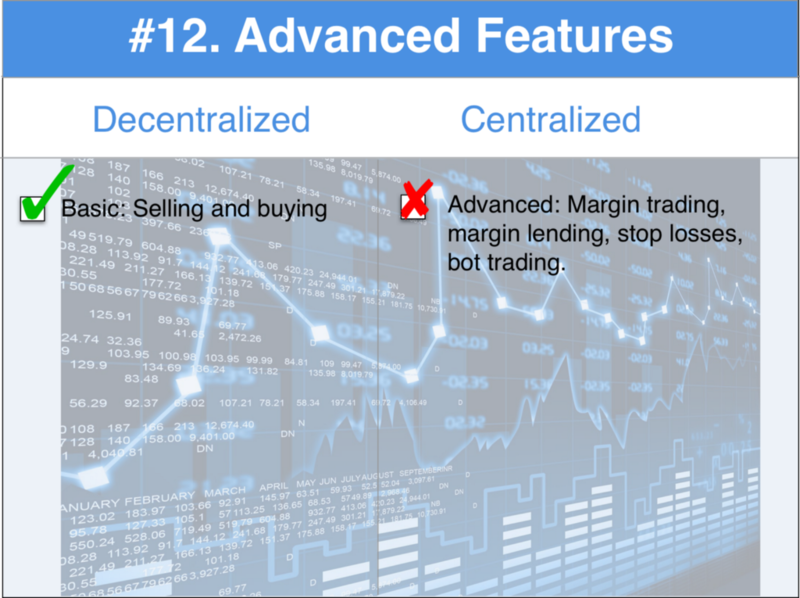 If you’re a professional investor very few DEXs can satisfy advanced functionality like margin trading, stop losses, bot and algorithmic trading. DEXs like IDEX are redefining this limitation but its still pales in comparison to advanced CEXs with API interfaces and CCTX integration. Which Is the Right Fit For You — DEX or CEX? The quick answer is it just depends on your needs. Some are willing to settle for the DEX limitations to support the decentralized movement. The privacy, security and availability advantages have already won many over today. Its just the dawn in the evolution of the decentralized exchange. 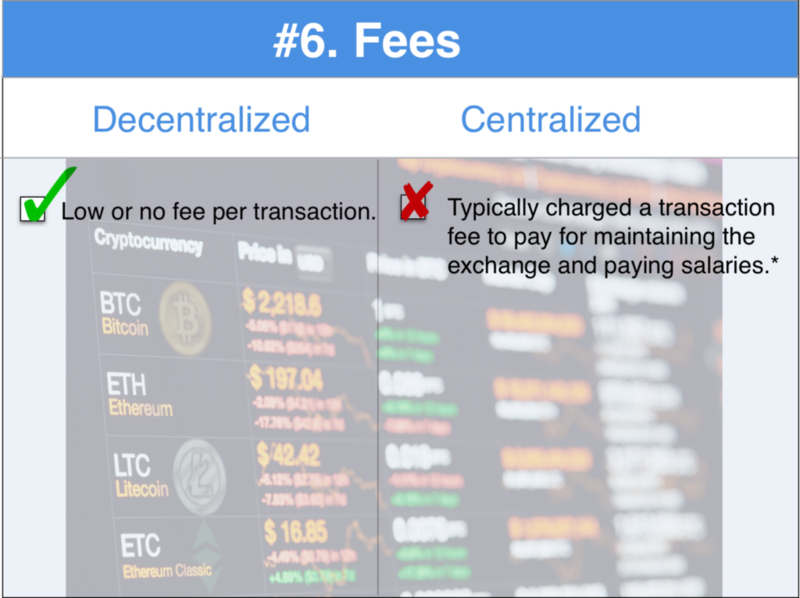 A Visual Way to Understand the Pros and Cons of a Decentralized Exchange was originally published in Data Driven Investor on Medium, where people are continuing the conversation by highlighting and responding to this story.